Well here it is my first video oven cleaning van cast which I filmed today on the way to my jobs. My wife is saying whats the point of it with some choice words thrown in, but it's a start and that's the main thing and to me it's a great first attempt at putting some sort of video blog together. It's been filmed in beautiful HD and I think I've got the sound right too. The camera position on the dash means that my head is cut off a bit so they can only get better. I refer to the 'Daihatsu' Extol as a 'Daihatsul' Extol – it's living in Bristol that has done that – the old putting 'l' on the end of word ending in a vowel; it isn't something I would normally do – honest. The electrical problem with the Citroen Berlingo van that I refer to doesn't appear to be an inherent problem and I think it is due to the fact that the battery is flat because I left the rear compartment LED light on, last week, when I was showing an auto electrician guy how they were wired – I thought it was controlled by the van door but obviously not! Though when we phoned Citroen today they did say that there is a problem with the Berlingo van that gives the same symptoms, so it may have to go back to the Citroen garage. I'm going to get the van going and see if we get the problem again now that I've switched that light off. The symptoms are when you get it and turn the key, all the dashboard lights up and nothing happens. 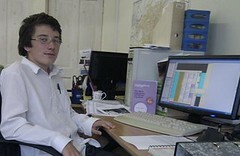 The Traffic Master starts speaking to you and says 'if you want to call the emergency services press the button now'. To me this is confusing as when it's not working like this you think it's referring to the AA as they've called themselves the fourth or fifth emergency service in those ads. Last week our guy John pressed the button and the Police turned up. Today I didn't touch it. 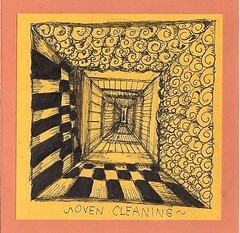 But in all it was a lovely day today for cleaning ovens, and all went very well. Cleaning all those student ovens last week has turned me into a super oven cleaner. was to go and get some milk as we were out and because we wanted a cup of tea. birthdays then in the last column was their email address. name tags on the appropriate draw and checking what stuff was in their. the staffs there are friendly and there is a good atmosphere about the place. Is The Parked Up OvenGleam van in Bristol working Graham? If you been reading my posts about my own 30 Amp AGA you will know that back in April we had a problem with one of the elements. Well the engineer actually replaced the fan first as he said that was the problem, but it still didn't work so we had to get them back a few days later. The cost of the AGA repair was over £300 altogether. Well now just a few months later the same thing has happened, last week. The AGA has gone cold and we called out the AGA engineer from Spillers and they told us that yes it was another element. So after 20 minutes and £159 later (£80 call out fee, £24 for half an hour labour and £59 for new element) the AGA was fixed. We have the older 20 Amp AGA so the elements are in series. If one goes the AGA gets cold. 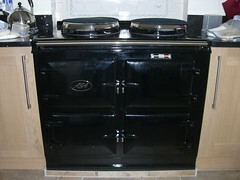 The new AGAs have banks of 6 and 2 x 4 elements in parallel, so if one element goes the AGA will still stay hot. So the cost was for replacing one element. I asked the engineer if it was anything to do with the control knob as on both occasions we had turned the AGA down (on the 30 amp it has a knob and we put the setting to zero) prior to going away for a long weekend. When we got back we turned the knob back up (up to position 4 or 5) and then it didn't get hot and got colder over the next few days. He said that it was unlikely and was a coincidence. He didn't check the switch. My wife wasn't there and says she doesn't think it's a coincidence at all. We have decided not to 'turn down' the AGA again if we go away as it is going to put at least another £150 on to the cost of going away for the weekend. I'm going to find out the method of replacing the elements so that I can do it myself. Well I am a trained electronics technician after all. AGA Total Control Buy or Not to Buy? Well I really did really ache on Tuesday (after cleaning 8 ovens the day before in the student accommodation block) and I think I said that 'I never want to clean an oven again'. But anyway I got there on the Tuesday and cleaned a more casual four ovens. Then I did four on Wednesday. Our other employees were there too helping me out and we got all the 28 ovens done by the end of Wednesday. Then the cleaning company asked us if we could do another 24 ovens by the end of Wednesday next week. So on Thursday I went back and cleaned another eight ovens in the student accommodation block next door to the one where we had been for the start of the week and today I have cleaned another six. So that is fourteen of the 24 done and we are all going back next week to clean the other ten. I seemed to have got back in the groove over the last couple of days and have really managed to work really hard and get the jobs done. Also the cleaning company gave me my own security key which helped a lot as I could find the easier ovens to clean and cleaned all those first. The really dirty ones, and I really mean really dirty, are the ten that we are going to tackle as a team next week. On Thursday in our team meeting I gave myself the 'Oven Cleaner of the week' award. Well I don't think I'm going to win it again this year and I knew that my total number of ovens for the week was going to be 34. So in all this wasn't bad at all, and this beat my previous record of 32 in a week which was also obtained cleaning ovens in a student accommodation block. It helps to have all the ovens in one place, to have a set period of time to get them done in and once you get in the swing of things and put some effort in then they get done. Anyway I hope I'm not aching too much over the weekend. Why oh Why are ALL Student Ovens Dirty? Some ovens are dirty than others! Yes I did buy 92 toothbrushes today. I think there may be a song about it. Well okay there isn't but I spent the drive home trying to think of one. The Red Balloons song seemed a good song to re jig the lyrics and get something sorted out all about 92 toothbrushes. So why did I buy 92 toothbrushes? Are my teeth that bad? Well no my teeth are fabulous, and even more so since I have used my Oral B Triumph 5000 toothbrush everyday this year, it does a superb job. No I bought the toothbrushes from Tesco as their value toothbrushes are superb for oven cleaning. The reason they are so great is because you can really put some pressure on them and they don't break. I have tried normal toothbrushes like a medium bristle Oral B but the head snaps off within five minutes. The Tesco ones are indestructible and they are cheap. They cost 10p for a packet of two; so 5p each. I took all of the ones on the shelf today and then had to get to the till with them grasped in my hands, I kept on dropping them everywhere; I was only going to buy a couple but last time they were 20p each so MAJOR savings! So if you are looking for a great oven cleaning toothbrush the Tesco value toothbrushes are the ones to get. Today I have been out cleaning ovens in student accommodation, we got the job late last Friday afternoon. A cleaning company had been let down by another oven cleaning company and they wanted 28 ovens cleaned by the end of Thursday this week. I think we were the only company that could help them out – I could have possibly done all of them myself but I would have probably been half dead by the end of the week. So me out in the oven cleaning van. Funny with this time of year and student cleans I tend to get out a lot. I actually did some cleans on Saturday too. Last year this time I was in Cardiff doing oven cleans on student lets myself and spent weeks cleaning ovens for a student accommodation company. So today it was an early start to get there by eight thirty and had I had to wait a bit before the main cleaning contractors turned up who subsequently took the piss out of my 'Pie Van' – my Daihatsu Extol. Hmm some pie van; I am not sure if pie vans get a turnover of £50K a year per van. Up in the lift to the top of the building and then four ovens per floor on each of the seven floors. It was a bit of pain getting all the racks etc down to the van but I did get it all done okay. In all I have cleaned 8 ovens and one of the guys turned up and cleaned 2 so in all we cleaned 10 ovens today. Really I think I've overdone it as I feel really done it. We have to get another 18 ovens to clean in the same block so I'm back again tomorrow to clean some more and I'm going to be joined, for bits of the day, by a couple of the other guys. So hopefully we will get another 12 done and get the rest done on Wednesday. I'm looking at getting just four done myself tomorrow, I going to pace myself a bit more! Really these sort of jobs are good and bad, the good thing is that we are now completely booked up for the rest of the week, the bad stuff is getting all done by a set time. Student ovens can vary in dirtiness somethings they need just a little cleaning and other times they are completely disgusting and the work is corresponding more. But at the end of the day todays students expect to get clean fresh accommodation which of course means a clean kitchen with a clean cooker.